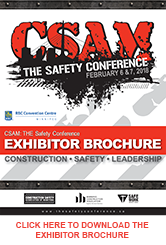 Thank you for your interest in sponsoring CSAM: THE Safety Conference, proudly recognized as Canada's premier construction safety conference. As a Sponsor, our number one priority is to ensure that your dollars are spent wisely. Each sponsorship level offers exclusive opportunities for exposure and interaction amongst 1,800 workers and decision-makers from construction companies across Manitoba. Throughout the conference, you'll have the opportunity to promote your products and services, engage with your target markets and represent your side of the industry. A portion of the fees help sponsor students enrolled in vocational post-secondary education to attend the conference.